PRP treatment for hair loss or baldness is a 3-step restorative treatment, which involves drawing the blood of the patient, processing it, and injecting it into the scalp. Most people in the therapeutic community feel that Platelet-rich plasma injections activate the growth of hair when the blood supply to the follicles is increased. Most times, this technique is joined with various male pattern baldness medications or strategies. There is no sufficient research to demonstrate if PRP for hair loss is a powerful hair loss therapy. Despite the fact that there is not enough scientific research done on Platelet-rich plasma hair loss, PRP treatment for hair loss has been utilized for issues like healing injured muscles ligaments, and tendons since the 1980s. The alpha granules degranulate when it contacts the coagulation triggers when preparing the Platelet-rich plasma. The biologic process of Platelet-rich plasma happens when the discharged growth factors attach to their separate receptors expressed in epidermal cells, osteoblasts, stem cells, endothelial cells, and fibroblasts. Platelet-rich plasma is used broadly for tissue and wound healing and is generally utilized for surgical wounds, dental procedures, and bone grafts. The use of PRP for bone grafts is approved by the FDA since it helps improve the handling properties of bone graft in orthopedic practices. Consequently, using PRP for other practices is regarded as "off-label." Activated Platelet-rich plasma is a rising restorative option for balding or hair loss as a result of the fundamental scientific research on the impacts of Platelet-rich plasma on hair follicles. The growth factors present in the Platelet-rich plasma for hair loss take action in the bulge part of the hair follicle, especially where they attach to their separate receptors situated in the stem cells. Platelet-derived growth factors or PDGFs are needed for the development of dermal mesenchyme and the formation of the hair canal. When different growth factors bind, it boosts cell survival by hindering apoptosis and extends the anagen stage of the hair growth cycle. Also when mice are injected with activated Platelet-rich plasma, it stimulates quicker telogen-to-anagen change compared to what is seen on control mice. This preclinical information brings to mind that Platelet-rich plasma can serve as a good treatment of AGA. Currently, there is limited distributed information with respect to Platelet-rich plasma’s potential impact on hair loss. Platelet-rich plasma treatment involves infusing concentrated autologous platelets into the hair follicles, when activated, delivers growth factors. The use of Platelet-rich plasma’s in androgenetic alopecia was initially recognized together with surgical hair restoration. The donor follicular units with Platelet-rich plasma expanded the hair production rate by 15.1 percent. A double-blind irregular trial further recorded that follicular grafts kept in Platelet-rich plasma have enhanced survival while recording in vitro inhibition of dermal papilla apoptosis, an extension of the anagen stage. The use of PRP for hair loss as a treatment for AGA patients has demonstrated significant success. Also, studies have reported a critical increment in hair thickness and diameter after several Platelet-rich plasma injections. 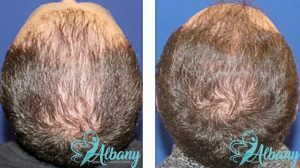 An ongoing report analyzed Platelet-rich plasma injections in twenty patients with AGA and discovered that hair thickness increased greatly peaking at three months to 1 year. Adding DP or Dalteparin/protamine to absorb, balance out, and release growth factors continuously in Platelet-rich plasma, it may give a lot of changes than Platelet-rich plasma alone. Like LLLT, the delivery and preparation of PRP carry a lot of factors that have not been analyzed extensively. Different Platelet-rich plasma products available vary preparation technique, platelet concentration, and kind of platelet activator utilized. There has been an absence of similar investigations to institutionalize the Platelet-rich plasma procedural parameters. Additional controlled examinations are required to assess Platelet-rich plasma as a treatment for hair loss. Most Platelet-rich plasma treatment needs 3 treatments four to six weeks apart. Also, maintenance therapy is needed every four to six months. The patient’s blood is drawn from the arm and placed in a centrifuge in order to spin it quickly to separate liquids of various densities. Using a syringe, the PRP is injected into regions of the scalp experiencing hair loss. Also, there is a possibility that you may react to the analgesic used in the treatment. If you choose to undergo a PRP treatment for hair loss, talk to your doctor about your forbearance to anesthetics. PRP for hair loss is an effective and safe treatment for reversing baldness or hair loss and enhancing new hair growth. Speak with a doctor to ascertain the right treatment for you. Albany cosmetic and laser center provide complete non-surgical cosmetic procedures. Dr. Kamal Alhallak is a Pharmacist with a doctorate in pharmacy and Pharmaceutical Sciences. He has special training in cosmetic injectables such as Botox, fillers and plasma injection. He has one of the best satisfaction rates in Alberta. Other services provided by the center are Fraxel laser, Laser hair removal, skin tightening, wrinkle removal, body shaping, tattoo removal and other services.